I'm not a big fan of very sweet desserts. However, there are days when the only thing that can cheer me up is …sugar, lots, and lots of sugar…Not very healthy, I know, but it does work, well at least for a moment ;-) Today's cake recipe is incredibly sweet. 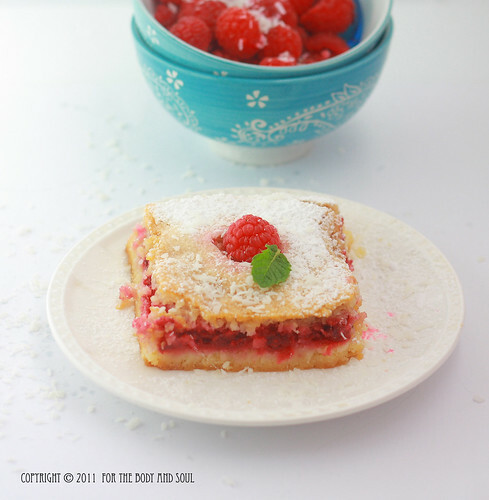 It is made of short crust pastry and raspberries covered with sweet coconut mixture. 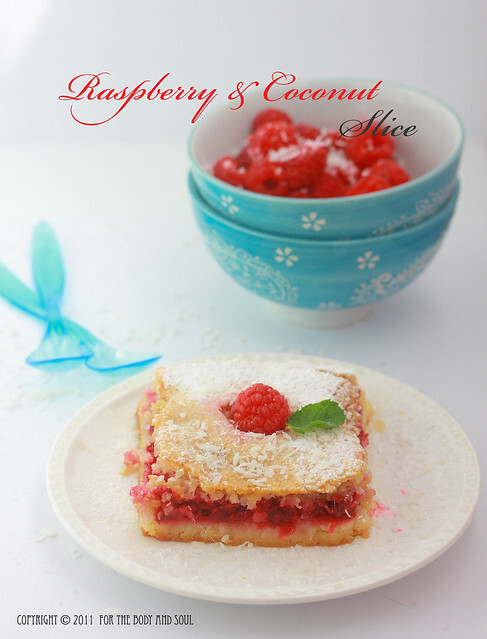 Coconut and raspberry is one of the combinations that you cannot go wrong with, so the cake is truly delicious. Because of the high sugar content, I would recommend it mostly to those of you who love very sweet desserts though. The recipe comes from the book I mentioned yesterday: Indulgence: Slices. Preheat the oven to 180 C (350 F). Lightly grease 20 x 30 cm (8 x 12 inch) baking pan, line with baking paper. Sift 220 g (1 ¾ cups) of the flour into a large bowl. Add the almonds and 100 g ( ½ cup) of the sugar. Stir to combine. Rub in the butter with your fingertips until the mixture resembles fine breadcrumbs. Press into prepared baking pan. Reduce the oven temperature to 150C (300 F). Sift the remaining flour, nutmeg and baking powder into a separate dish. Beat the eggs, remaining sugar and vanilla extract with electric beaters for 4 minutes, or until light and creamy. Fold in the flour mixture with a large metal spoon. 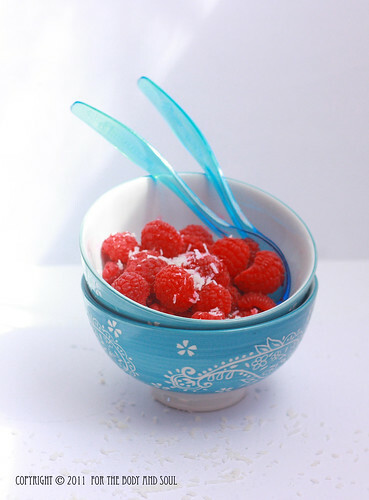 Stir in lemon juice, coconut and raspberries. Pour the mixture over the base. Bake for 1 hour, or until golden. If the top browns too quickly, cover with aluminum foil. Set aside to cool in the pan. Gently cut into pieces. Dust with icing sugar.